King Salman Park in Riyadh ... set to be the largest city park in the world. The projects include King Salman Park, Sports Boulevard, Green Riyadh and Riyadh Art, construction of which will start in the second half of 2019. These project complement the Saudi Vision 2030’s “Quality of Life” Programme and are aligned with the UN Sustainable Development Goals, to create sustainable cities and communities, while driving urgent action against climate change. They will offer opportunities worth $15 billion for the private sector to invest in the residential, commercial, recreational and wellness areas, said senior government officials. Spread over a sprawling 13.4-sq-km area, King Salman Park will be a green oasis in an urban setting and will be the largest city park in the world. Besides residences and hotels, it will also feature a Royal Arts Complex, theatres, museums, cinemas, sports venues, water features, restaurants and an 18-hole Royal Golf Course. 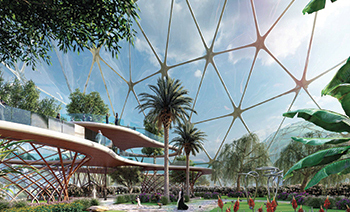 Omrania, a leading architectural and engineering consultancy practice based in Saudi Arabia, has won an international competition to design King Salman Park. The park will take shape on the grounds of the old airport in Riyadh and will also boast several landmark assets, including the Riyadh Fountains and a Vertical Garden. As an environmentally sustainable urban development, it will offer opportunities for the international community in arts, entertainment and culture, stated the officials. Riyadh Art is the world’s single largest government investment in public art and will establish the city as “a gallery without walls” through a world-class interactive public arts programme. The highlight of Riyadh Art will be an iconic installation that will be Riyadh’s 21st century landmark art statement, to be created by the world’s most innovative, creative and ambitious talent, they added.